Land records can be a treasure trove for genealogy. Take for example two transactions for property once belonging to my 5th great-grandfather Thomas Kirk. These deed transfers identified a lost great-aunt and revealed the size of Thomas' estate at the time he died in 1846. Readers of this blog know that I am trying to learn who Thomas Kirk's parents were. It's been an arduous ordeal due to spotty record keeping and burned courthouses. As I examine all existent record sets, I've come to one last area of focus - the land records held in the Licking County Recorder's Office. I am baffled as to how these survived when all other courthouse records - marriages, probates, etc. - went up in smoke. But I am grateful that anything remains. About a month ago, I submitted a very broad request for all land records mentioning Thomas Kirk. A kindly clerk in the office indulged me and took the time to entertain my unfocused request. She returned copies of a handful of land records. Many were not for my Thomas, but two were gems. 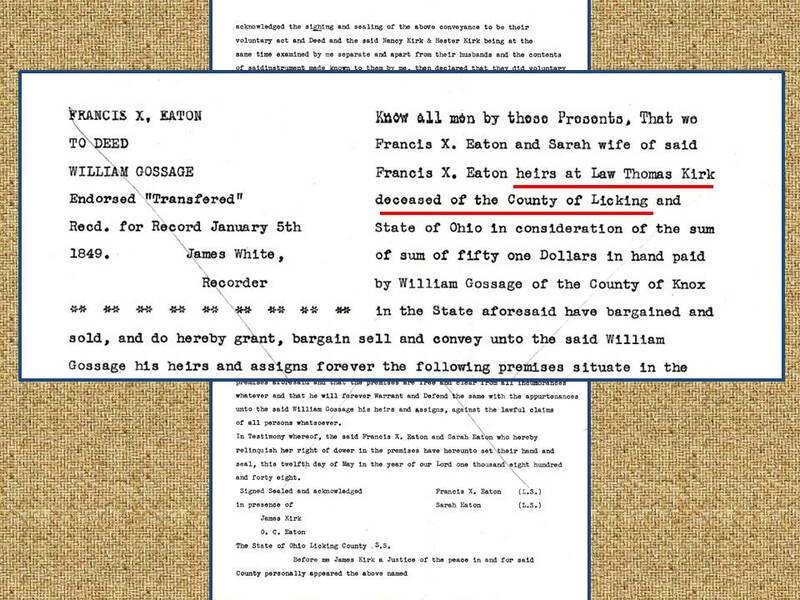 On May 11, 1848, two of Thomas' sons, William and Thomas Jr., along with their wives sold 33 acres of land in Monroe Township, Licking County, Ohio for $310 to a William Gossage. What's particularly exciting about this record is that it infers they inherited the land from their deceased father Thomas. "Know all men by these presents that we William Kirk and Nancy his wife, Thomas Kirk and Hester his wife heirs at law of Thomas Kirk deceased of the County of Licking and State of Ohio..."
Thomas' last known location - as enumerated in the 1840 census - was in Monroe Township. It appears - as heirs at law - that his sons have inherited some of his property in Monroe Township following his death in 1846 and are selling their stake. The next genealogy gem came by happenstance. On the second page of the above-mentioned land transaction, there were the beginnings of a new transaction. 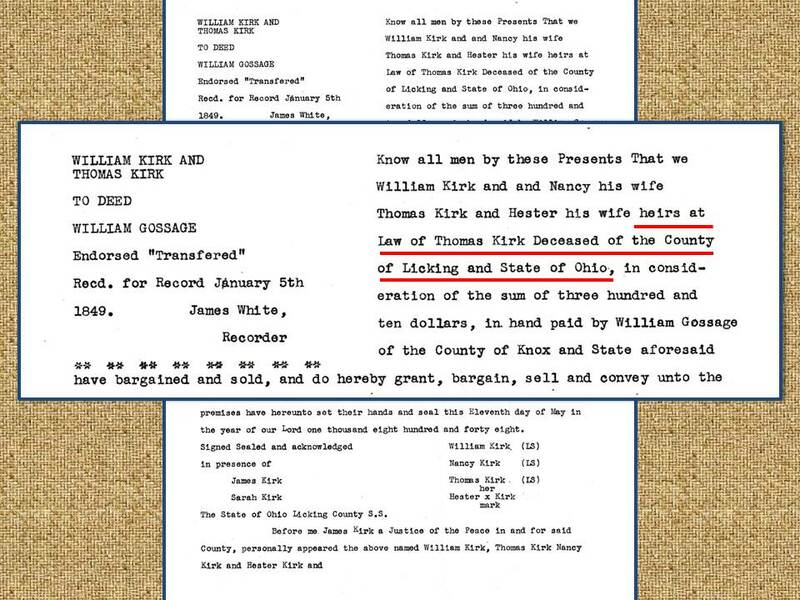 The Licking County clerk had crossed it out since it was separate and seemingly unrelated to the record involving Thomas' sons. I casually glanced at the record, which outlined the sale of 5 1/2 acres of land in Monroe Township on May 12, 1848 by Francis X. Eaton to the very same William Gossage. Recognizing the same name and township, I read the record more closely. 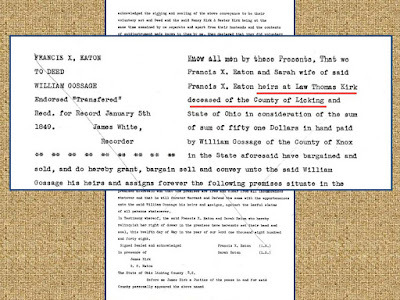 "Know all men by these presents, that we Francis X. Eaton and Sarah wife of said Francis X. Eaton heirs at law of Thomas Kirk deceased of the County of Licking and State of Ohio..."
Now wait just a minute! Who were Francis and Sarah Eaton that were also heirs of the deceased Thomas Kirk and selling what appeared to be inherited property? I searched the census records for Licking County and found a Francis X. Eaton in the 1850 census with a Sarah (presumably his wife). Sarah was born in Ohio and her age was enumerated as 22 years old, suggesting she was born in approximately 1828. She was born too late to realistically be a daughter of Thomas' wife Sarah Bonar who would have been about 44 years old at that time. I traced Sarah and Francis Eaton through decades of census enumerations, following their move from Ohio to Iowa. In the 1880 census, their relationship as husband and wife was confirmed. 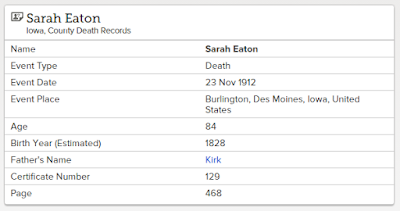 From 1850 to her final enumeration in 1910, Sarah Eaton's census appearances revealed she and her father were born in Ohio and her mother was born in Pennsylvania. 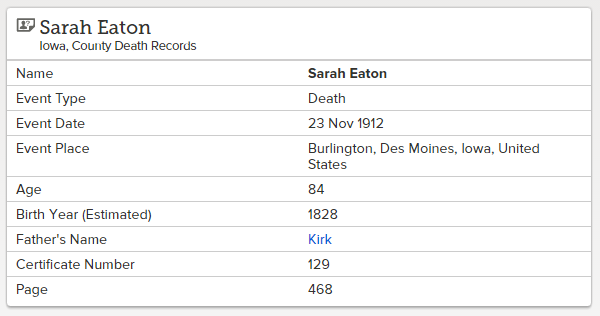 A brief synopsis of her death certificate (on FamilySearch.org), showed that Sarah Eaton died November 23, 1912 in Des Moines. 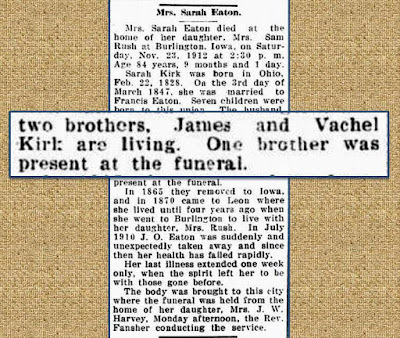 A burial index indicated she was buried in Leon Cemetery in Decatur County, Iowa. The real kicker came from her death certificate synopsis (also on FamilySearch.org), which provided her father's surname (not his full name, mind you. Just his surname. We wouldn't want to make this too easy! ): Kirk. Of course, I plan to order her death certificate from Iowa to see if the parents' full names are included. But in the meantime I turned to Chronicling America to see if I could locate an obituary. Sure enough, I did! Disappointingly, it didn't mention her parents names. However, it provided a clue that helped me resolve the mystery of Sarah and position her on the appropriate branch of the Kirk family tree. The link was confirmed thanks to the mention of her two brothers. Thomas Kirk (1778-1846) had no children who settled in Iowa. However, his widowed daughter-in-law and her children moved to Iowa following the death of Thomas' eldest son Vachel in 1832. Vachel Kirk (born in Ohio) and Jane Delzell (born in Pennsylvania) had two sons: James (my 3rd great-grandfather) and Vachel Jr. I knew Vachel and Jane had a daughter, but I lost track of her because she was not enumerated with her mother or brothers in the 1850 census. She either died or was married by that time. Her obituary confirmed that she married in 1847. 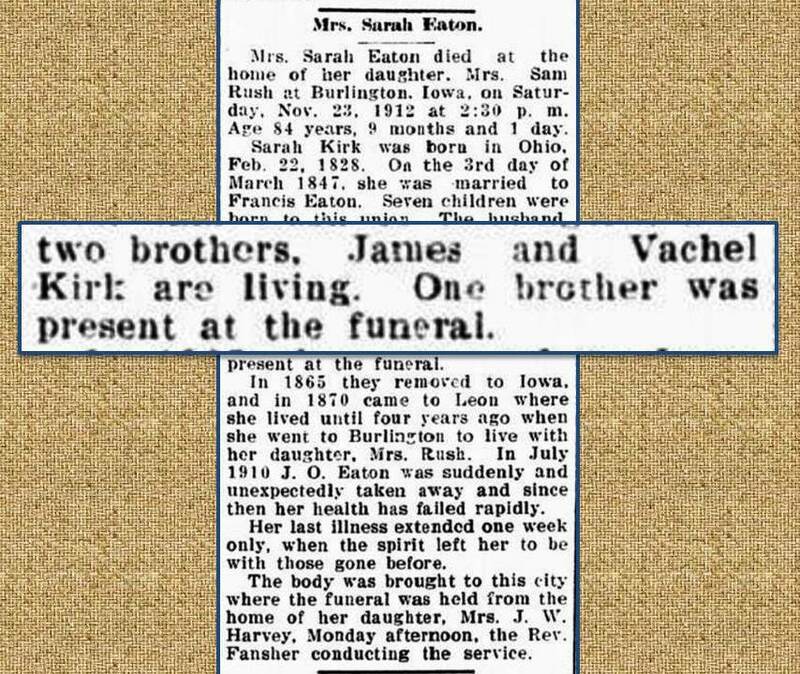 Sarah (Kirk) Eaton born in 1828 was the lost daughter of Vachel and Jane Kirk. Land records had rediscovered my 4th great-aunt! It appears that following Thomas Kirk's death, each of his children received 16.5 acres of land. 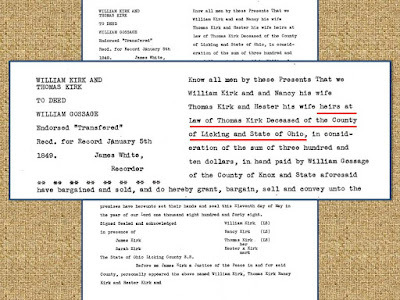 Sons William and Thomas Jr. collectively sold 33 acres (divide that amount by two sons and each son had 16.5 acres). Sarah (Kirk) Eaton sold 5.5 acres. From that sale we can deduce that 16.5 acres were inherited by Vachel's three living heirs and split evenly (16.5 split between three children is 5.5). We know Thomas Kirk had a large family - at least 9 children who survived him. Did they each inherit 16.5 acres? Unfortunately, no probate record has been found to answer this question (since it was likely destroyed by fire in the Licking County Courthouse). But if each of his 9 children and the grandchildren of his deceased son Vachel inherited 16.5 acres, we're looking at an estate of 165 acres. A decent size for the 1840s. In 1848, each of those acres was sold for approximately 11 cents. While land was cheap, I'm sure that this was still a considerable sum for a farmer of that era. He likely owned a lot of land; enough so that his living heirs each inherited 16.5 acres. 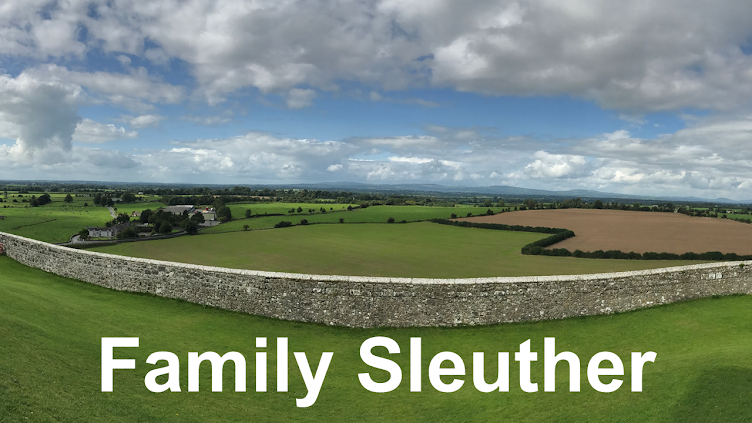 Thomas' sizable estate and his granddaughter - my 4th great-aunt - emerged from obscurity thanks to land transactions, reinforcing the important role these records can play in genealogy, and the need to include them in a reasonably exhaustive search. I'm a big fan of land records too. They led you on a merry chase. Thanks, Barbara. Given that Thomas' probate record was likely lost to fire (a huge loss), these land records felt like secret and very valuable surviving pieces of that probate package. I'm definitely a huge fan, too. I just picked up "Courthouse Research for Family Historians" by Christine Rose and "Locating Your Roots - Discover Your Ancestors Using Land Records" by Patricia Law Hatcher to help me get a better grasp on the legalese of the land records. You make a good point about the quitclaim possibility, and clearly I need to brush up on the topic! I'm excited to see what other bits of this puzzle may come from inspecting William Gossage's land purchases. The fun never ends (I need to set up shop in Licking County :) Thanks for the comments and suggestions! I appreciate having an Ohioan gently guide me along. Thomas Kirk isn't yielding his secrets easily! Thank you, Jana. I appreciate being included in your Fab Finds!